At the closing of their first face-to-face meeting on April 7, President Donald Trump and Chinese leader Xi Jinping enthused about their newfound rapport. 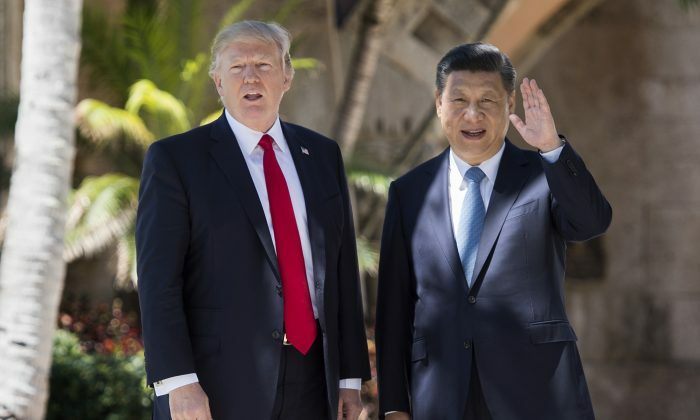 “The relationship developed by President Xi and myself I think is outstanding,” Trump said at a meeting in his Mar-a-Lago resort in Florida. For Xi and Trump, building a cordial relationship and gaining each other’s trust during the two-day U.S.–China summit were crucial achievements, according to Li Tianxiao, a senior political commentator with New Tang Dynasty Television (NTD), a sister media of The Epoch Times. Although no specifics of the Trump–Xi meeting were released, the statements and actions of the Trump administration following the meeting suggest that the rapport between Trump and Xi had translated into some measure of tangible diplomatic success for the United States. Trump made it clear in the days leading up to the meeting that he would talk to Xi about the rogue North Korean regime of Kim Jong Un and about China’s trade surplus with the United States. In a news briefing after the meeting on April 7, U.S. Commerce Secretary Wilbur Ross said that Chinese officials had agreed to a “100-day plan” on trade between the two countries, an unheard of development because trade discussions usually span several years. Ross added that Chinese officials had “expressed an interest” in reducing the trade surplus with the United States—a win for Trump, if actualized. U.S. Secretary of State Rex Tillerson said at the same news briefing that both countries “reaffirmed their commitment to a denuclearized Korean Peninsula.” The next day, a U.S. Navy strike group set out from Singapore to the Korean Peninsula, in a show of force in response to the Kim regime’s recent testing of intermediate-range missiles. While the Chinese regime traditionally condemns unilateral military action, particular in the case of its sister communist country North Korea, there is a possibility that Xi could actually tolerate a U.S. move against Kim Jong Un, according to Zhang Tianliang, a commentator on contemporary Chinese political and social issues. Former Chinese leader Jiang Zemin helms an influential political faction that is in opposition to the Xi Jinping leadership. “Xi Jinping sees no benefits in protecting North Korea because the country has long come under the sway of Jiang Zemin’s faction. Zhou Yongkang, Liu Yunshan, and Zhang Dejiang are die-hard supporters of the North Korean regime,” Zhang said on an NTD current affairs program. Former Chinese leader Jiang Zemin helms an influential political faction that is in opposition to the Xi Jinping leadership. Zhou Yongkang, Liu Yunshan, and Zhang Dejiang are key lieutenants of Jiang’s faction, as well as former or serving members of the powerful Politburo Standing Committee. Since taking office in 2012, Xi has been seeking to purge the regime of the Jiang faction via an anti-corruption campaign and end the culture of corruption and kleptocracy put in place by Jiang. If Xi is able to avoid provoking the United States before he moves in on his predecessor Jiang, then Xi, like Trump, may likewise be cherishing the “tremendous progress” in China–U.S. relations.